Can I get a sample of the product I would like to order? We do not offer production proofs or first articles for ribbons. You may request a sample of many products and materials. Sample requests will be generic products showing the capabilities of our machines and processes. A proof will be emailed to you soon after we process your orders so that you can approve the design of your product. Will I get a proof of what my product will look like, before production begins? Yes. For all Custom Ribbons, a proof will be created and emailed to you soon after your order has been processed. Please make any revisions, if any, on this proof and return it to us. The production of your ribbons will NOT begin until you have approved your design and we receive a signed proof. How are imprinted ribbons created? Using foils and a heat transfer process, your design is hot-stamped directly onto a ribbon with a polymer or metal stamp. Why is a metal stamp required/recommended? Imprinted ribbons ribbons require a stamp to transfer your logo and/or text to the ribbons. A metal die is required whenever you have selected a custom logo, have text that is small or uses a fancier font, when certain imprint colors are selected, or when over a thousand ribbons are ordered. Text badge ribbons are offered with a polymer die, at a lower cost, which will work for basic lettering that is 24 points or larger with a silver or gold imprint. All stock title badge ribbons are created using a metal die. If you would like to order stock titles and custom titles at the same event, you may want to consider using a metal die for your custom titles, to maintain a uniform appearance on all ribbons. Why is vector art required? The quality of your printed ribbons is dependent upon the quality of the artwork submitted to Personalized Ribbons. Vector art retains its quality when the size of the images is changed. It also provides the clean edges between colors that are required to produce metal and polymer dies. Vector artwork is required for all imprinted ribbons that have your logo or custom artwork. If you don't have a vector file, we offer an artwork clean-up/conversion process of $30.00 per image. This process will trace your bitmap, capturing the underlying shapes in a vector format. There is a 24 hour turnaround time required for this service and no expediting option is available. The vector file will be sent to you upon payment. A bitmap image is not converted to a vector format when it is saved or embedded into a vector file; when this is attempted the image is simply embedded in the new file and no conversion takes place. When printing on a ribbon roll, how do I get the imprint so that it is only on the ends of my bow? Use a ribbon the width that you want, to create the shape that you need. If you will be tying it around something, use something of a similar size to tie it around to create your mock-up. Trim or mark the ends. If you will be cutting the tails off at an angle, be sure to measure from the longest point. 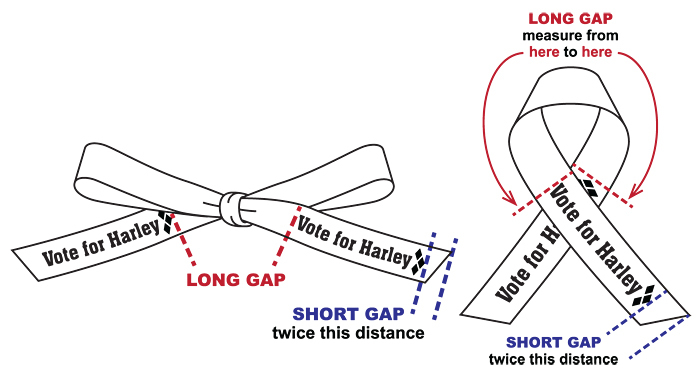 The ribbon will be imprinted with the long and short gaps that you specify. The final result will be a ribbon with two imprints, a big space, then two more imprints. You will then cut between the two imprints that are close together to create strips with an imprint on either end. A - Ruler depicting a length to-scale side-to-side. B - Rough sketch of where the imprints will be in relationship to each other. Side-to-side distances are to-scale; height of imprints and ribbon have not been adjusted to match finished product. Use the ruler above to verify that the long gap, short gap, and imprints are all the length required. C - Larger view of finished ribbon, showing the imprint to-scale and an estimation of the requested colors. The area of the imprints and the short gap can usually be shown. The long gap will not fit, so is represented by the spaces on either end. What are the differences between stock, custom and full color badge ribbon? More than 40 pre-imprinted ribbon titles, each is available on flag blue ribbon and one other ribbon color. Minimum order: 25 ribbons, you may mix and match ribbon titles and colors to meet this minimum. Orders placed before 11:00 AM (MT) will be shipped the same day. Orders placed after the 11:00 AM (MT) deadline will be shipped the following business day. Add your custom text and/or logo to the ribbons. You select the ribbon and imprint color. Minimum order: 25 ribbons, you may mix and match unique ribbon layouts to meet this minimum. Set up fee: $9.50 for each unique ribbon layout when using a polymer die, $30 for each title if a metal die is requested or required (this included the manufacturing of your dies). You will receive a proof for each unique ribbon layout, this proof must be approved and returned to us before production will begin. Production time: 2 to 6 business days. The production time is defined by your request; the quantity of titles and ribbons and the type of die selected (metal or polymer). Your ribbon will be printed in full color directly onto the ribbon, allowing for multiple colors, gradients, and detailed images. While the ribbon is printed on a white material, the background colors of your design may be extended (bleed) off the edges of the ribbon. Minimum order: 100 ribbons. Titles and colors may NOT be mixed. Set up fee: $30 for each unique ribbon title. If you supply camera ready art this set up fee may be reduced to $15. You will need to follow all instructions found on the order page to qualify for the reduced set up fee. You will receive a proof which must be approved and returned to us before production will begin. Production time: Standard production time is 7 business days after we receive a signed proof. Production times may need to be increased due to the quantity or complexity of your order and the limits of our production capacity. Can I combine multiple ribbon titles to meet minimum order requirements and qualify for discount pricing? Minimum requirements depend on which ribbon type you are ordering. Some ribbons, such as Full Color Badge Ribbons, do not offer variants in order to meet the minimum. Other ribbon choices require certain variants to remain the same while allowing titles to change (e.g., Horizontal Badge Ribbons can be ordered with different titles and color choices, but must remain as a horizontal orientation). What are the set up fees for badge ribbons? What is the difference between polymer and metal stamps? Polymer stamps are made from a softer material making the final product less crisp. Polymer dies work well for basic lettering that is 24 point or larger, imprinting in silver and gold and for rush orders. Polymer dies are only available for custom text ribbons. Metal stamps create much cleaner edges and are required for all logos, fancier fonts, a lot of text, certain imprint colors, or more than 1000 ribbons of any title. Metal dies are created off-site, and will increase production time by 2 days. When is a metal stamp required? What is the cost of a metal stamp and how long does it take to be manufactured? The cost of a metal stamp is $30.00 per unique ribbon layout (includes the $9.50 set-up fee) and will add an additional two business days to the total production time. What is the difference between Prize and Custom Rosettes? Prize rosettes are a cost effective way to recognize every winner and achievement. Choose from five rosette styles: Victory Torch, Place, Star, Gymnastics, Swim. Rosettes are 4 inches in diameter and 12 inches from top to bottom, with a string back. Colors and titles are pre-set for each rosette style. First to sixth place rosettes are available for all styles. Other mentions and options may be available, see the individual order pages for a complete list of available titles. Minimum Order: 10 rosettes, you may mix and match rosette titles to meet the minimum order. Pricing: $1.80 to $2.30 per rosette. Custom rosette ribbons are awards that are worthy of any event. All aspects of these ribbons may be fully customized. Choose from 10 rosette styles ranging from a single layer, four inch rosette to a deluxe six inch rosette with multiple layers, loops and tassels. Three rosette center styles are available, with an available library of stock designs, or you may provide a custom design. Select from thirty ribbon colors. Choose up to three colors for each rosette. Rosettes streamers are available in multiple lengths, with each rosette style having from one to six streamers. Streamers will be imprinted with your information in your choice of imprint color. Choose a hook, pin, string or plain back fastener. Minimum Order: 10 rosettes, you may mix and match ribbon colors and streamer text to meet the minimum order. Pricing: $2.48 to $31.00 per rosette, plus set-up fees. How can I place an order for custom rosettes? We offer two convenient ways for you to place an order; by phone (1-800-272-5729) or online. Due to the complex nature of the rosette ribbons, ordering by phone is most likely the easier method of the two. By phone, you can speak with one of our customer service representatives who can answer your questions, help you put together an order and can provide you with an accurate quote. Online, you can view various images and samples, see the ribbon colors and center designs and check out the prices and production times, as well as place an order. Due to the complex nature of custom rosettes, customer service will always email you with a final quote and a proof, which must be approved before production begins. Can I see what my rosette ribbon will look like before I place an order? Yes, a design proof is included with every rosette order. The design proof will provide you with a visual representation of your rosette design. If any changes to the design need to be made, you may make the revisions on the proof and resend/refax it to us. The standard proof creation time is two business days and production will not begin until we receive a signed proof from you, approving the design. Why would the pricing for my online rosette order be different than the quote that I was sent for approval? Due to these vast number of customization possibilities, along with specific pricing that may or may not be associated with each of these options it is very difficult to accurately quote these products. We will review each order, creating a final quote for the product you ordered at the best possible price, including quantity discounts. Due to the complex nature of custom rosettes, customer service will always email you with a final quote and a proof, which must be approved before production begins. What is a set? How many may I have on my order? By default, every rosette order includes one set; this set is where you put together your first rosette design. A new set is needed anytime you need to make a change to this first design. Adding additional sets does not automatically add a cost; however, depending on the desired change, there may be an additional cost for that change. Our online ordering form allows up to six sets, but you may create as many sets as you'd like; simply give us a call and speak with a customer service representative. Do you have a list of stock rosette center images to choose from? Can I use my custom rosette center design? Is there a cost? Yes, you may use your own custom text or logo/image on the rosette centers. Custom text has a $20.00 set-up cost if your order has less than a quantity of 200. Custom images/logos can either be hot-stamped (Gold Rim Center) or full color printed (Button Center). Full color printed logos have no set-up costs or minimum quantities; hot-stamped logos have a $60.00 set-up charge and an additional $20.00 set-up cost if the quantity is less than 200. Why am I required to purchase a metal stamp (die)? A metal stamp is required when a custom image/logo or excessive text is needed for your rosette ribbon design. The cost of a metal stamp ranges from $60.00 to $220.00 depending on the size of your design and is required for a custom imprinted center design and when the ribbon text exceeds 14 lines of print. Your stamp will be kept in our files for three years; each time you reorder using your stamp, the three years is renewed. Is it possible to change the text form one rosette ribbon to another? Yes, each set of text changes requires a new set. After you've designed your first set, you may replace up to four lines of text for each additional set. There is a $2.00 line change charge for each line that is replaced. What color options are available for printing? The default imprint color is gold foil, unless specified otherwise. For additional imprint colors please review the product order pages. What is the turnaround time on a rosette order? The standard production time for rosette ribbons is six business days. If a metal stamp is needed an additional four business days will be added to the total production time, increasing the total time to 10 business days. Expedite options are available to reduce production times; however, the four days to create a metal stamp can't be expedited. Production will not begin until you've signed and returned your design proof. What set up costs are associated with rosette ribbons?? Is there a minimum quantity requirement? Some of the smaller rosette styles do have a minimum quantity, please refer to each products order page for details. For these styles,there is a minimum quantity of 10 for each rosette order. However, if your order is below 25 ribbons (total), you will be charged a $20.00 small order fee. In general, it is less expensive to order 25 rosettes and pay the extra per unit cost than paying the $20.00 set-up cost for ordering less than 25 ribbons.